"...an enchanting wonderland of visual delight and sensual savvy." 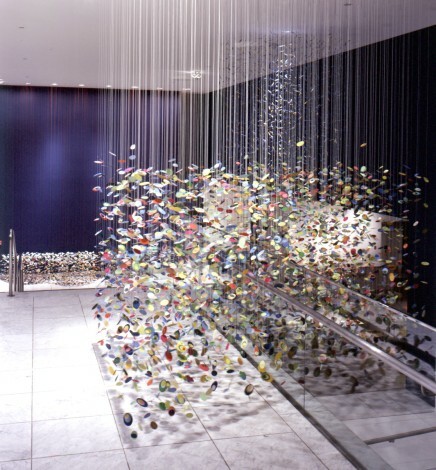 Drawn from an abundance of art historical and pop cultural sources, Pae White’s cascading mobiles evoke everything from schools of fish, flocks of birds, and teeming ponds, to Impressionist paintings with their myriad marks. 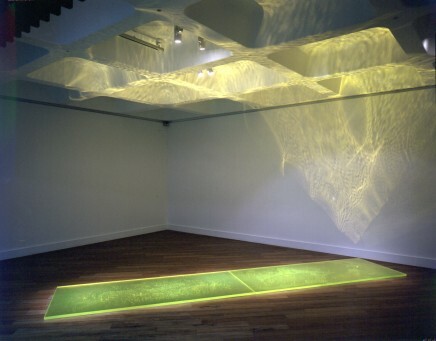 White describes this body of work as “an exploration of movement contained.” Like “a waterfall on pause” the works are “a flurry of color and gentle movement, suspended for contemplation.” Made with brightly colored cut paper strung on colored thread, the pieces move in response to the slightest breath, defining three-dimensional space while remaining fluid. Organized by James Elaine, curator of Hammer Projects. Pae White was born in 1963 in Pasadena, California. She lives and works in Los Angeles. She received her M.F.A. from Art Center College of Design in Pasadena and her B.A. from Scripps College in Claremont, California. She also studied at the Skowhegan School of Painting and Sculpture in Maine. Recent solo exhibition venues include Galerie Daniel Buchholz, Cologne; galleria francesca kaufmann, Milan; the Govett-Brewster Art Gallery, New Plymouth, New Zealand; the Contemporary Art Gallery, Vancouver; greengrassi, London; and 1301PE, Los Angeles. Group exhibitions include The Americans: New Art, organized by the Barbican Art Centre in London, and Made in California: Art, Image, and Identity, 1900-2000, organized by the Los Angeles County Museum of Art. 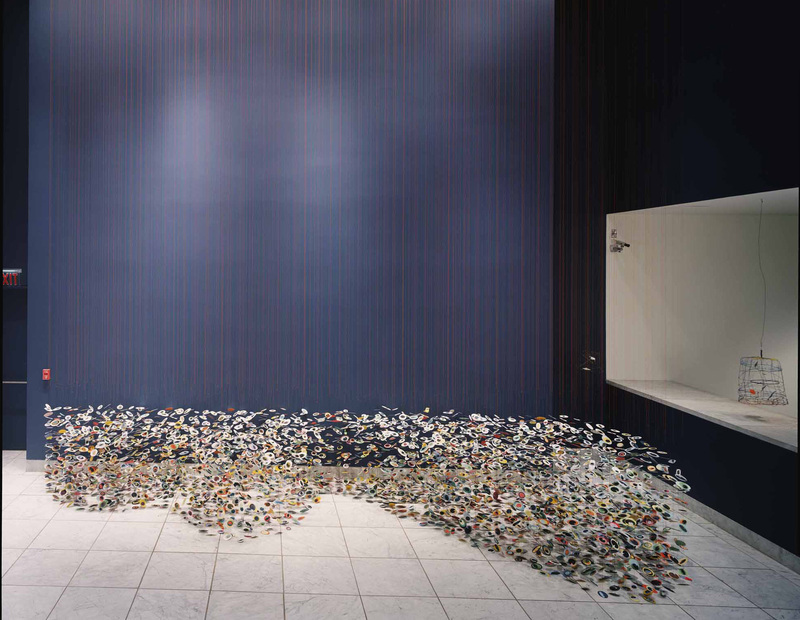 Articles on her work have appeared in Frieze, Tema Celeste, Contemporary, Art Monthly, and Artforum, among others. In addition she has designed publications and advertisements for a number of museums, galleries, and magazines. Seasoned gallery goers these days are used to art taking just about any form imaginable. Still, under duress and given enough time, we might just be able to conceive of a few things that we would never think of as art. Parisian air has been done (Marcel Duchamp), so have twelve live horses (Jannis Kounellis), as has a giant trench in the desert (Michael Heizer). These days we would have to look beyond the found object, however banal or extraordinary, for something one couldn’t imagine calling art. If I had been able to think of it, a set of fully functioning cast-iron barbecues in the shape of stylized animals might have fit the bill. A series of twelve working clocks made of paper representing the signs of the zodiac, or adverts in magazines for other artists’ exhibitions, might have done too. Clearly animal barbecues, paper clocks, chandeliers, and birdcages don’t operate like traditional art objects, if we take that to mean painting or sculpture. Yet neither do they sit easily within an avant-garde notion of the art object as neither painting nor sculpture. Pae White’s work isn't obviously oppositional enough for that. For one, her work utilizes too many of painting and sculpture’s values while remaining neither. For another, though a reductive form is often the starting point, the end results are usually formally complex and runaway decorative. The attitude of the work, too, is decidedly un-avant-garde: it has a playfulness, a deceptive lightness, a sense of whimsy and caprice that are alien to the avant-garde program. White’s work resists the kind of analysis an avant-garde object demands by instilling a sense of wonder and reverie in the viewer; we tend to lose ourselves in the works’ intricate beauty and the allusions that they put into play. These allusions are largely our own, since any imagery in the work is too ambiguous or too plain weird to act prescriptively. In a specific sense, the work has no hidden meanings and nothing to decode. Its engagement with viewers is egalitarian. The mobiles, for instance, rely less on an understanding of Postminimalist sculpture than our ability to picture the movement of swarms, schools, and flocks of brilliantly colored creatures in water or air—or, perhaps, our knowledge of Californian or Antipodean ghost towns. That said, Pae White belongs to a generation of international artists who have revived issues of site and context that have remained largely unexplored since the mid-1970s. Although at times you find her work where you would expect it—that is, at eye level on walls or somewhere central on the floor—you are just as likely to find it covering windows, suspended in midair, or stacked up around a corner between two rooms. Often you won't find it in exhibition spaces at all, but in areas of museums and galleries dedicated to activities other than the display of art: the bookshop window (Galerie Daniel Buchholz, Cologne), for instance, the office (China Art Objects, Los Angeles), a children's learning area (Los Angeles County Museum of Art), or foyer (the Hammer piece you've just been looking at). It undergoes a more extreme process of dispersal when it takes the multiple format of covers for magazines (four issues of Make: Women’s Art Magazine), advertisements for galleries (a series of twelve for neugerriemschneider in Frieze), or invitation cards and catalogs for other artists’ exhibitions (Jorge Pardo and Tobias Rehberger, for example). There are historical precedents for all of this, especially in art of the late 1960s. When Attitudes Become Form, the seminal group exhibition exploring late-1960s tendencies curated by Harald Szeemann at Kunsthalle Bern in 1969, featured works sited along the edge of the floor (Richard Serra’s Splash Piece), suspended in the air (Gilberto Zorio’s Untitled [Torcia]), on the staircase (Kounellis’s sacks of grain), all over the Kunsthalle (Richard Artschwager’s Blps), out on the sidewalk (Heizer’s Berne Depression) and beyond Bern altogether (Richard Long’s walk in the Swiss Alps). From the mid- to late 1960s Conceptual artists such as Mel Bochner, Dan Graham, Douglas Huebler, Joseph Kosuth, and Robert Smithson used magazines as sites for works that took the form of inserts, articles, and advertisements. From 1968 to 1971 the New York gallerist Seth Siegelaub produced a number of books that acted as sites for solo and group exhibitions. You need only look at Pae White’s work for a split second to realize that it occupies these types of spaces quite differently. Postminimalist sculptors used raw industrial and natural materials in part to narrow the divide between work and site and art and life. Conceptual artists, especially, sought visual neutrality in order to present their reflexive ideas on art with as much clarity as possible, bald text being their preferred medium. Some believed that these anti-aesthetic strategies functioned politically: that by avoiding seductive colors, forms, and materials they were resisting the art market in particular and capitalism in general. There is nothing visually raw or neutral about Pae White’s aesthetic: colors are dazzling, words are set in idiosyncratic typefaces, and the materials she favors are delicate and lush. Even when she is working minimally, the effect is ravishing and at times hallucinatory. Take Copy Cat Lap, 1998 for example. The two slabs of vivid yellow Plexiglas throw wavelike reflections on the gallery ceiling that are quite at odds with the matte metal and firebrick floor works Carl Andre is known for. One of the reasons for Postminimalism’s failure to close the gap between art and life was its rejection of the popular aesthetics of its era. White and other artists of her generation have embraced the style and function of applied arts to an extent not seen since the days of the Bauhaus. The results are works that duck in and out of their art status precisely because they camouflage their conceptual underpinnings in the aesthetics and uses of images, objects, and structures belonging to the designed world. Are the animal-shaped grills from Briquettes and Support, 2003 sculptures or barbecues? Is the publication accompanying the group exhibition What If: Art on the Verge of Architecture and Design (Moderna Museet, Stockholm, 2000) a catalog or Pae White multiple? It’s the significance of style that sets White apart from the artists who explored new sites in the late 1960s. Style was suppressed then, while in her work it is overt. Its operation has the effect of personalizing whatever space she uses, be that the spaces of an institution or the work of a contemporary. When Pae White’s ebullient yet light-footed work is around, the logic that distinguishes one artist from another, the artist from gallery, or spaces designated for art from areas designated for other uses, is made to seem pedantic and obsolete. Alex Farquharson is a curator, writer, and lecturer who lives in London. Hammer Projects are made possible with support from The Horace W. Goldsmith Foundation, The Annenberg Foundation, the Los Angeles County Arts Commission, and members of the Hammer Circle. O R O S C O P O, 2004, is funded, in part, by an ARC grant from the Durfee Foundation.